Anthony R. "Tony" Kane, Executive Director. On May 15, 2018, Anthony R. "Tony" Kane, former FHWA Executive Director (1994-2001), passed away after a long illness at the age of 72. His colleagues will remember the friend with an easy laugh who rose through the ranks to the highest career position in the Agency. But his true legacy is his contribution to the country's transportation system. 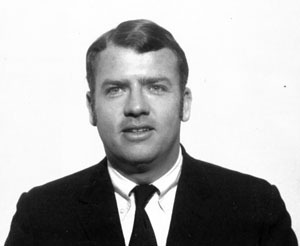 Tony Kane joined FHWA in 1968. Tony, as he was always called, was born in New Hyde Park on Long Island, New York City, in 1945. He earned a Bachelor of Science in Civil Engineering from Rensselaer Polytechnic Institute (1963-1967) at a time when transportation planning was enhanced by the Federal-Aid Highway Act of 1962, which required Federal-aid highway projects in metropolitan areas to be chosen by a 3C process (for continuing, comprehensive, and cooperative) after July 1, 1965. He decided to be part of this revolution. He pursued his plan at Northwestern University (1967-1968), where he secured his Master's Degree in Civil Engineering with a focus on Urban Transportation Planning - Systems. At the time, Garland E. Marple, Director of FHWA's Office of Planning, was recruiting university graduates with Master's Degrees. Tony accepted a position with FHWA that began in 1968 with an 18-month training program. Around the time he was completing the program, Tony was drafted in 1970 as a commissioned officer in the U.S. Army and was assigned as environmental field engineer for the U.S. Public Health Service on the Crow and Cheyenne Indian Reservations in Montana (1970-1972). He and his wife Jackie lived on the reservation. "It was a pretty shocking experience after growing up in New York City," he said years later, "but one that I really enjoyed and learned a lot from." While he taught the Native Americans how to lay sewer lines and water pipes, they showed him how to fish and hunt - skills he had not learned growing up in the city. Of the residents of the reservation, he said, "They were among the most dedicated construction workers I have ever seen." 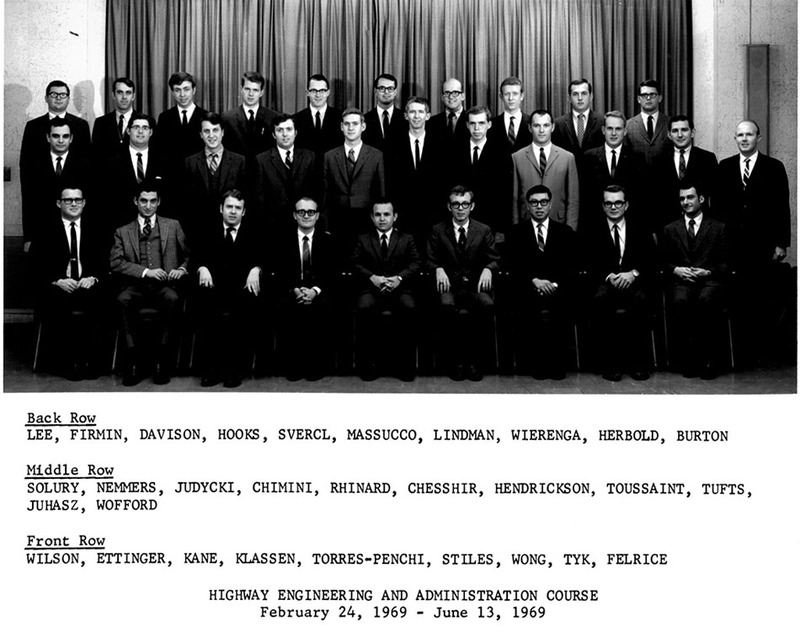 Tony Kane (front row, third from left) graduated from the Highway Engineering and Administration Court in 1969. Directly behind him (second row, third from left) is Dennis C. "Denny" Judycki, who would be Tony's friend throughout his life. Returning to civilian life, Tony began as a Highway Engineer in FHWA's Office of Program and Policy Planning (1972-1974). After 2 years as a Program Analyst (1974-1976), he was designated Technical Coordinator in the Office of Highway Planning. During these years, he attended George Washington University (1972-1978) to earn a Ph.D. Dr. Kane's thesis was on Cost Trends and Productivity Advances in the Federal-Aid Highway Construction Contracting Industry, 1956-1975. 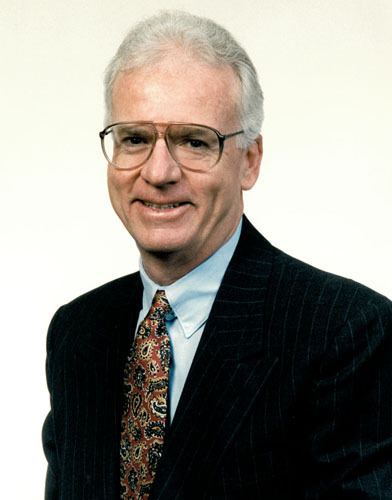 In 1979, Tony became Chief of the Systems Analysis Branch in the Transportation and Socio-Economic Studies Division, where he oversaw the cost allocation study that was published in May 1982 (attributing the cost of construction and upkeep to the different types of vehicles using the highways). With Secretary of Transportation Drew Lewis and Federal Highway Administrator Ray A. Barnhart promoting a nickel-a-gallon gas tax to help reverse the "crumbling infrastructure" crisis of the day, Tony was positioned to help with the data to support the proposal and a range of other taxes based on vehicle damage to roads and bridges. On May 18, when Secretary Lewis and others presented the case for the tax increase to President Ronald Reagan and the Cabinet Council on Economic Affairs, they brought Tony along to the White House as a resource - an unusual honor considering Tony's status in FHWA. His friends recall that Tony "was the 'whiteboard' carrier, the means used to make the presentation to the President." 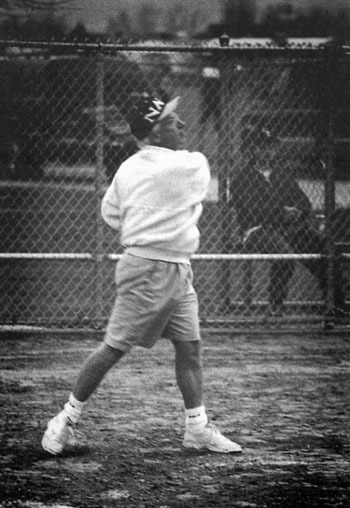 President Reagan deferred approval of the tax increases at the time, but approved the idea later in the year. The Surface Transportation Assistance Act of 1982 included the new taxes that by the mid-1980s had helped reverse the deteriorating condition of the aging Interstate System and the Nation's bridges. In the 1980s, he became Director, Office of Policy Development (1984-1987), and Associate Administrator for Right-of-Way and Environment (1987-1990). In a reorganization, he became Associate Administrator for Program Development (1990-1994). In 1989, Secretary of Transportation Samuel K. Skinner, who took office under President George H. W. Bush, launched the National Transportation Policy (NTP) initiative to develop ideas for the post-Interstate era through the year 2050. Although the NTP was headed by Deputy Secretary Elaine L. Chao and Federal Highway Administrator Thomas D. Larson, they selected Tony and Cynthia (Cindy) J. Burbank of the Office of the Secretary to oversee the work. Tony and Cindy assembled a staff from the DOT's Modal Administrations, organized more than 100 seminars and outreach events across the country, and published several volumes of policy papers. In March 1990, President Bush and Secretary Skinner unveiled the NTP at the White House. The legislative proposals emerging from the NTP became the backbone of the landmark Intermodal Surface Transportation Efficiency Act of 1991 (ISTEA), which set the structure of the post-Interstate era for the Federal-aid highway, safety, and transit programs, including a re-balanced relationship among Federal, State, and local officials. In announcing Tony's appointment in 1990 as Associate Administrator for Program Development, Administrator Larson said, "Tony has done an outstanding job on Secretary Skinner's National Transportation Policy, and I am confident that he will be an asset to the FHWA in this new role." In 1995, following the retirement of Executive Director E. Dean Carlson, Federal Highway Administrator Rodney E. Slater selected Tony to be the new Executive Director. The Administrator said that Tony was a leader who "knows the strengths of our Agency but who can think 'outside the box' to challenge the FHWA family to think anew." Slater added that he counted on Tony "to make things happen" and praised his "spirit of innovation." As the top career official in FHWA, Tony oversaw the Agency's day-to-day operation. He was instrumental in developing and implementing high priority national programs to enhance America's major transportation system. The most important new program under ISTEA was the National Highway System (NHS), a concept Dr. Kane helped shape during the NTP and advanced first as Associate Administrator and then as Executive Director through cooperation with the transportation community, including the selection of routes and securing adoption in the National Highway System Designation Act of 1995. While in Salt Lake City for a conference, Tony joined the Utah Division Office's Barricades softball game, helping them to a 10-7 victory. In addition to a key catch in the outfield, Tony secured two hits in three at bats before pulling a quad muscle rounding second base in the third inning. Tony was always conscious of the needs of the individual by developing staff through challenging assignments, formal and on-the-job-training, and counseling. He was committed to achieving excellence through diversity in FHWA's human resources by fostering expanded management development opportunities. As part of his aggressive recruitment of and advancement opportunities for women, minorities, and people with disabilities, he appointed the first three female Division Administrators, the first female Regional Administrator, the first Hispanic Regional Administrator, and the first African-American Regional Administrator, as well as increases in the number of African-American, Asian-American, and Hispanic-American Division Administrators. Under his leadership, FHWA increased representation of minorities and women in Senior Executive Service positions from 20 to 31 percent. Throughout his tenure, Tony made a personal effort to reach out and listen to stakeholders' and industry organizations' ideas on ways for FHWA to improve program and project delivery and service. He promoted new strategies, such as the National Quality Initiative, for getting increased value from our transportation investment dollar. During his FHWA career, Tony received numerous honors, including the FHWA Administrator's Award for Superior Achievement (1980), the Arthur S. Fleming Award (1982), the Secretary's Meritorious Service Award--Silver Medal (1982), the Presidential Rank Award of Meritorious Executive (1985, 1990), the National Society of Professional Engineers' Engineer of the Year Award for FHWA(1985), the Presidential Rank Award of Distinguished Executive (1996), eight SES Performance Awards, and the 1997 P. D. McLean Memorial Award from the Road Gang for "outstanding contributions to the advancement of highway transportation in the public interest." Tony retired from FHWA on March 2, 2001, but continued his transportation career with the American Association of State Highway and Transportation Officials (AASHTO). On March 5, 2001, he became AASHTO's Director of Engineering and Technical Service. His responsibilities included developing transportation policy and legislative proposals, preparing technical publications and standards, developing and licensing AASHTOWare software products, and supporting AASHTO's numerous committees and task forces. Tony retired from AASHTO in 2013. Away from work, Tony was committed to philanthropy, with a special focus on the Ronald McDonald House Charities of Greater Washington, DC. He resurrected the Road Gang's annual golf tournament and turned it into a major fundraiser for the Ronald McDonald House. In recognition of his role in raising hundreds of thousands of dollars for the cause, the Road Gang renamed the event several years ago: the Tony Kane Road Gang Golf Tournament. Following Tony's death, AASHTO Executive Director Frederick G. "Bud" Wright, Tony's successor in 2001 as FHWA Executive Director, said, "Tony Kane was an extraordinary leader. He far exceeded most of us intellectually and he brought great energy to life, whether at work or play." Despite so many responsibilities at FHWA and AASHTO, "somehow Tony always found time to help so many as they made their way through careers and life, offering guidance and advice whenever it was needed or might help." Walter C. (Butch) Waidelich, Jr., FHWA's Executive Director, in informing FHWA of Tony's death, recalled, "He was a colleague and friend to many of you during his 30-year tenure at FHWA. He was committed to the Agency and continued to be a leader in transportation with his work at AASHTO." In a 1988 profile in FHWA News, Tony said, "FHWA has provided me with continuing challenges, and the importance of the highways program and the talents of the people I work with make it all worthwhile." For those of us who were fortunate to work directly for Tony, we will always remember his smile, his friendship, and his support for our careers. Tony is survived by his wife Jackie; two children, Megan and Sean; one much loved grandchild, Matthew; and two sisters, Diane Howland and Patricia Dews.